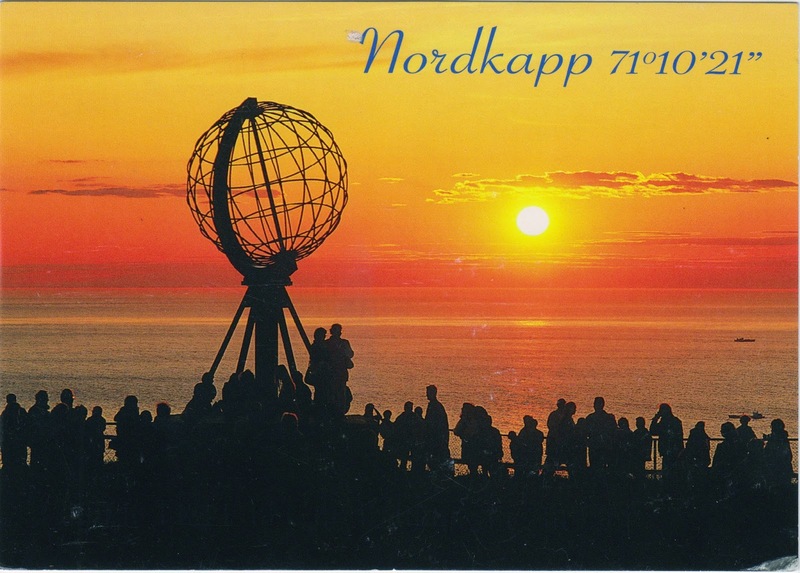 Postcard NO-102992 from Norway shows North Cape (Nordkapp in Norwegian), located on the northern coast of the island of Magerøya in Northern Norway and shown as a red pin in the following map. It is often mistakenly regarded as the northernmost point of Europe. However, the neighboring Knivskjellodden point, shown as a green pin on the map below, is 1,457 meters or 4,780 feet farther to the north, which is sometimes considered the northernmost point of the entire continent of Europe. Nonetheless, both of above points are located on an island. Cape Nordkinn (Kinnarodden in Norwegian), located on the Nordkinn Peninsula and shown as a yellow pin on the map, is the northernmost point of mainland Europe. Regardless, North Cape is a popular tourist attraction with a 307-meter or 1,007-foot high cliff where visitors can watch the midnight sun or the panoramic views of the Barents Sea, part of the Arctic Ocean, to the north on a large flat plateau. The midnight sun can be seen from May 14 to the July 31 during which the sun reaches its lowest point above the horizon from 12:14 to 12:24 a.m. Previously, I have featured the north cape in New Zealand in this blog.